Enticement marks the English-language debut of prominent Tibetan writer and filmmaker Pema Tseden. This collection gathers together his most relevant and influential short stories, including "Tharlo," which he adapted into an award-winning and internationally acclaimed film in 2015. 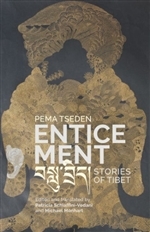 Written originally in the Chinese and Tibetan languages, these stories make use of a variety of literary styles and sources, ranging from traditional Tibetan oral tales to magical realism, surrealism, and the theater of the absurd. They humanize the Tibetan experience by stepping away from patronizing, mystic, or idealized visions of Tibet to speak with empathy and humor about the real challenges faced by Tibetans in the age of globalization.